When any show manages to stick around for more than a few seasons, there are usually a few obstacles, and a few benefits, to such longevity. For instance, a lengthy run certainly risks creative bankruptcy, the familiarity of the plots and comedic beats lose their lustre over time, as stories become more and more predictable. At the same time, a lengthy run leaves a lot of character traits and past plots to draw from and build on. Once characters are firmly established , there’s an ease with which a show, and particularly a sitcom, can produce episodes that capitalize on the audience’s familiarity. Ever since The Big Bang Theory became a cast of seven instead of a cast of five, the show has settled into a nice groove, which is no small feat for a show that’s been on the air for as long as this one has. These may be the twilight years of The Big Bang Theory (CBS and the cast have already agreed to at least two more seasons), but it feels like the show is only just finding itself. There’s an ease with which the show continues to find comedy in its ensemble, which is apparent in tonight’s episode, “The Anxiety Optimization,” which might be the funniest episode of the season. There’s not a lot of the emotional storylines that have defined some of the best episodes of The Big Bang Theory. Sure, Sheldon is dealing with potential failure in terms of his research into dark matter, but that’s mostly a footnote, an excuse to bring these characters together and have them let loose. This is the most purely comedic episode of the show that I’ve seen in some time; the jokes feel earned and fresh, most of them rooted in how familiar we are with these characters. They’re not just easy punchlines, but rather jokes informed by a shared history and an engagement with the show’s past. 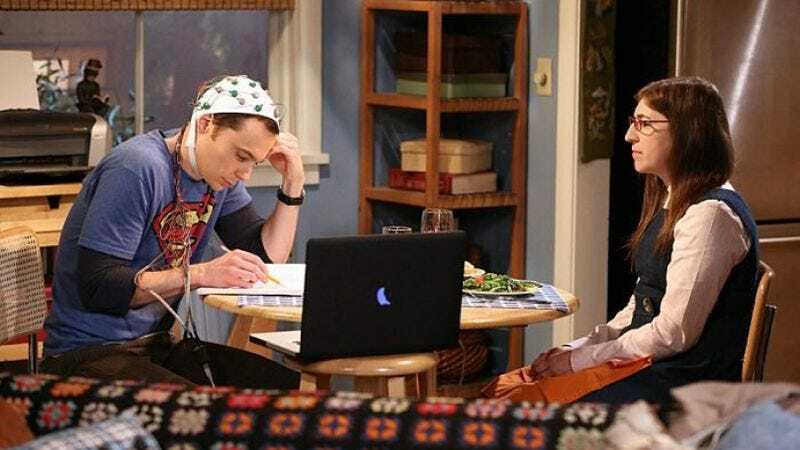 The very premise of the episode, which sees Sheldon petition his friends to annoy him and keep him on edge in order to induce “productive anxiety,” is the kind of silly, clearly ill-fated idea that sitcoms thrive on. It’s a premise that allows for levity, and best of all, it gives the characters (and actors) room to playfully poke fun at one another, a product of the familiarity with character traits that I mentioned above. Basically, the premise is a big excuse to have Jim Parsons act unhinged, and all of his friends to push him even further. A lot of the stuff with Sheldon this week is hilarious. From the opening gag with the noise cancelling headphones (where Penny lets it be known that Amy’s nickname for him is “The Virgin Piña Colada”), to his initial anxiety session with Amy (“sorry, I was aiming for your heart”), to his misguided analysis of what the ladies do when they’re on their own at Penny’s apartment (Sheldon assumes that they talk about who has the best cervix), it’s all part of Sheldon’s social inadequacy. It’s never mean-spirited or hacky though; instead, it’s charming, played purely for laughs without a hint of cynicism. That’s especially true during an extended scene of complex wordplay, where Sheldon tells the guys to consistently disagree with him, and then doesn’t initially catch on to them doing just that. The scene builds and builds to a boiling point where Sheldon storms off. He comes back though, and thanks them for helping him out, which is just a perfect delayed beat to conclude such a lengthy bit. It’s the kind of pace that The Big Bang Theory has always excelled with. As great as those beats are, some of the best comedic moments in this episode come from the extended gag that is “Emily or Cinnamon”; it’s a game Howard has created that presents a nauseating, pseudo-romantic quote as spoken by Raj, and asks whether or not he said it to Emily, his girlfriend, or Cinnamon, his dog. It’s the type of playful, knowing game that friends play amongst other friends. It’s bullying, yes, but the type that comes from lifelong friendship and a place of love. Unlike so much of the nastiness that bogged down the first half of this season, episode-long bits like this one feel more natural, and therefore are able to garner more laughs. The Big Bang Theory is at its best when it’s just the gang hanging out, talking about whether or not werewolves can swim and occasionally poking fun at the myriad of issues that every single member of the group has. The Big Bang Theory has given us some solid sitcom episodes that have tackled heavier emotional themes, but “The Anxiety Optimization” proves that perhaps the best iteration of this show is one that doesn’t try too hard to be anything other than an exaggerated look at what it’s like to grow, fail, change, and joke with the same people you’ve known for years and years. There’s an intimacy to the interactions, and the show is better for it. So, Emily made an appearance. That’s, um, something. Amy eats her bananas horizontally because her mother told her that’s how all the good girls do it. That Armadillo Isaac Newton hallucination near the end of the episode was legitimately terrifying. Sheldon quoted Taylor Swift, which was almost enough for me to push the grade of the episode to an A.